all mutilated. He must be a real right maniac, this fella. 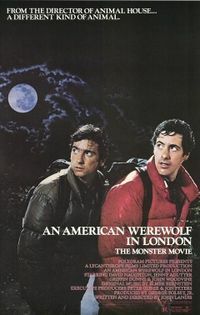 Two American college students, David Kessler (Naughton) and Jack Goodman (Dunne), are backpacking across the Yorkshire moors when they are attacked by a large, unknown animal. Jack is killed, but David survives the mauling and is taken to a hospital in London. When he wakes up some time later, he does not remember what happened and is told of his friend's death. Things get stranger when he is visited by Jack's reanimated corpse, who explains that they had been attacked by a werewolf, meaning that David himself is now a werewolf. Jack urges him to kill himself before the next full moon, not only because he is cursed to exist in a state of living death for as long as the bloodline of the werewolf that attacked them survives, but also to prevent David from cursing others when he transforms. Upon his release from the hospital, David moves in with his pretty young nurse, Alex Price (Agutter). He is in Alex's London apartment when the full moon rises and he is turned into a werewolf. In the form of a werewolf, David prowls the street and of the city, and slaughters a handful of innocent Londoners. When he wakes in the morning, he is naked on the floor of the wolf cage at the zoo, with no memory of his nocturnal adventures.